I am so so so happy to finally get this sweater pattern out in the world! It's the Cross My Heart Sweater, and it's the cutest little thing, featuring a unique eyelet and i-cord display along the front neckline. My favorite part about this sweater?? The body is worked in ONE PIECE! Gasp! Yep, the simplicity and ease of this pattern is possibly my favorite part about it. Okay maybe tied with the cool eyelets. It's designed to be longer in the back than in the front, so it'd pair great with a pair of comfy leggings! The pattern includes sizes XS-3X, so there's lots of options for sizing. And there's even a photo tutorial for how to add on those eyelets (it's way easier than you think!). The yarn I used was Yarn Bee Yarn Soft Secret in Light Denim (found at Hobby Lobby), it's a "lighter" yarn than others it's weight so take mind of that- I talk about this below. Be extra sure to read all the notes before starting in on the pattern! **please note that the yarn I used was a rather light “4” weight yarn. You can find good substitutes for this yarn by going to yarnsub.com or just keep this in mind when getting yarn. A good substitute I would recommend is Caron Simply Soft. -it's true that the K hook is larger than suggested for this weight of yarn. The reason for the larger hook is for more of a drape. Although, I HIGHLY RECOMMEND checking your gauge and adjust hook accordingly for an accurately-sized sweater. 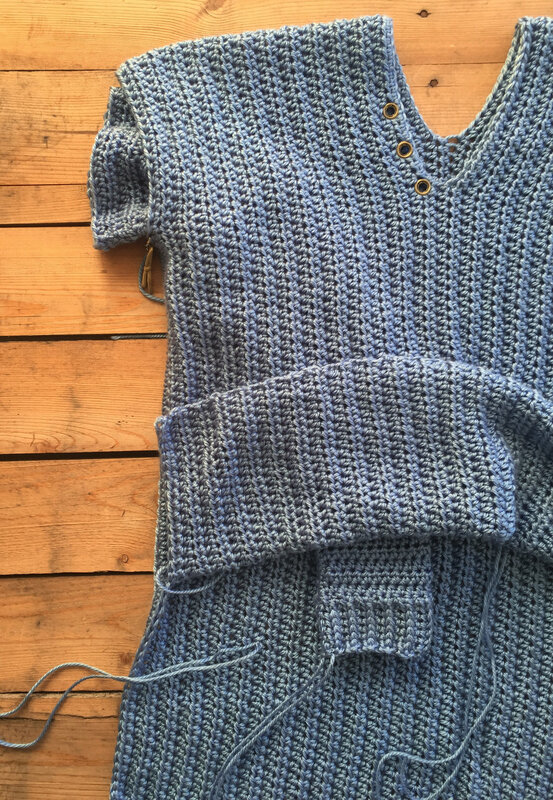 -the sweater body is worked in one piece, the skipped sts you work will create the neck hole. If you'd like to make your neck hole deeper, you could skip additional sts when working the neck hole row. -I designed the sleeves of this sweater to be a bit longer, which is just a preference of mine. 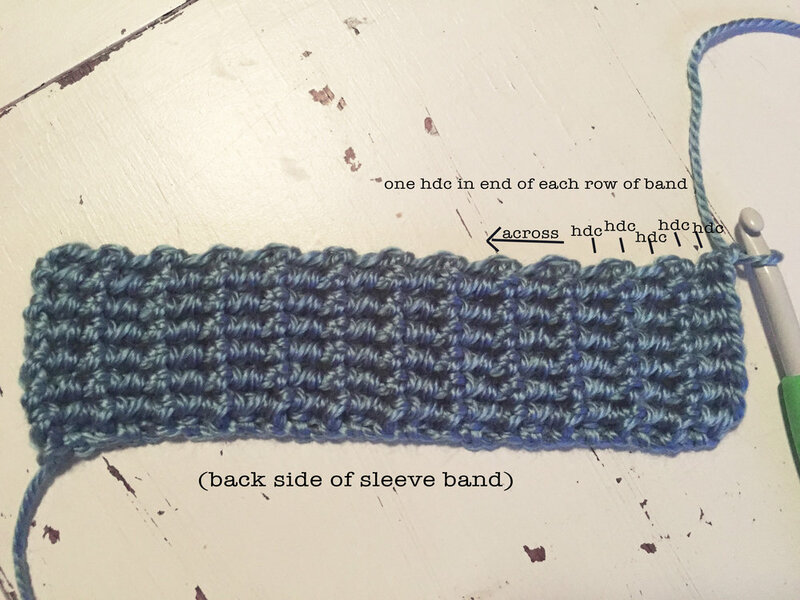 To shorten them up a bit, you can skip working the last rows of the sleeve after the last decrease. -I chose to add three eyelets to each side of the neckline, how many you’d like to do is obviously up to you! To begin assembling the sweater, fold the body in half, so the bottoms are together (like in above photo). It doesn’t matter which side is on the inside because both sides are the same. You will make the back side longer than the front side. You can tell the front and back sides apart by the length from the neck. The back side has more length from the neck than the front (the photo provided at the beginning of the pattern will help you identify which side is which). The back side will be 8 sts longer than the front. I put a st marker in the 8th st of the back side, and aligned the first st of the front side with that st marker. ****This is very important: you need to match up your sts exactly along each side of the sweater (this is important because you will need an exact amount of sts for your sleeves). You will start pinning 15 sts up from bottom of the front side (see above photo) To help in matching up the sts, I aligned them about 10 at a time, then put a st marker through both the front and back sides to secure. See below on how high up you should pin for each size..
You will fold the sleeve in half so that the long sides are aligned together, and right sides of the sleeve are touching. Then you’ll pin them together and sew using a whip stitch along the long open edge just like on the body sides. Make sure you’re aligning the rows so it’s even. After both your sleeves are sewed you will then connect them to the body. You will turn both sleeves to the right side, and the body will remain wrong side out (right sides together). Then you’ll put the sleeve on the inside of the body and align the top of the sleeve with the sleeve opening on the body(see above photo). You will align the seam of the sleeve with the armpit of the sweater body (shown above). 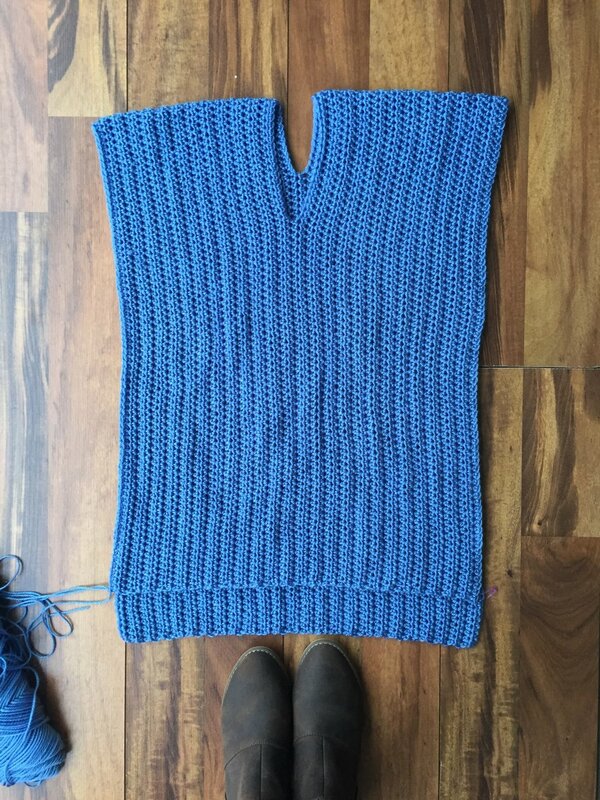 Once both sleeves are attached, and your sweater’s turned right side out, you’re finished with the assembly of the sweater! For the tutorial on adding the eyelets, see that post by clicking here. To make the i-cord for the ties, you can view this super helpful video by June Gilbank below--- I made my cord about four feet long. The length is obviously up to your preference! Then you'll weave in all your ends (ugh, I know-- if you're interested, though, I made a handy tutorial on a fail-proof way to weave in your ends found here). Then you're ready to lace up your sweater! Or it even looks really cute laced down to the bottom and tied with a bow! Both ways look great. Once it's laced, your new sweater just needs to be worn!! Take care, and happy hooking! !